Two photographs of the grain elevator in Harveyville, Kansas. 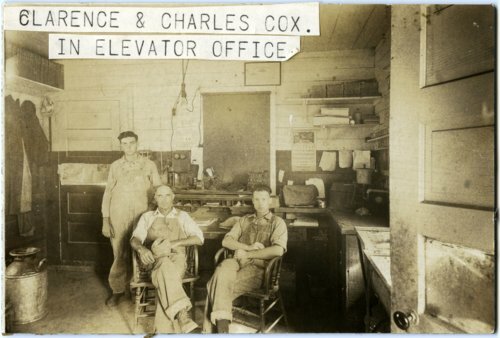 The first photograph shows three men sitting in the office of the elevator. Two of the men are identified as Clarence and Charles Cox. The second photograph shows an exterior view of the elevator. Two men standing on top of the elevator are identified as Bill Boatright and John Shrink.